Fast forward to my pregnancy with E. I started to take a more laid-back approach to motherhood (ok, it’s probably the whole 2nd baby thing), and realized I could try to rock the baby wearing look. When I ordered my free (pay shipping) Udder Cover, I soon got an offer for a free Seven Sling. It involved sizing (which I measure all the time and according to their site have correct). Sizing scared me. What if I gained more weight than I expected? What if I suddenly lost weight post-baby? What if my ladies ballooned in cup size? So many ifs, so I bought size insurance. 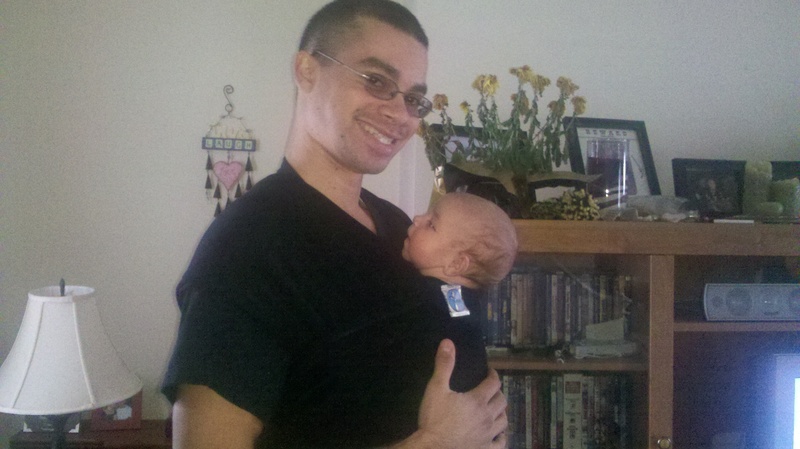 Evan arrived, and after he was a few weeks old, I decided to put him in the sling and walk around the house with him. I was comfortable, but he wasn’t exactly “close enough to kiss”. After about 5 minutes, he would get really upset. Now I see realize that the sling was pretty uncomfortable for him–I compare it to low thread count sheets. Basically, he didn’t like being held in a sling position by a carrier that I wouldn’t think twice about wearing as a piece of clothing. I didn’t want to give up. 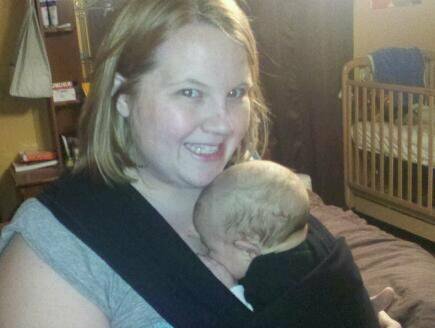 So, I became a Twitter lurker on some chats and learned about the Moby Wrap. After many reviews, this seemed like the one for me. This carrier was made of higher quality material that felt like a t-shirt. Unlike other similar carriers, there wasn’t a size to be chosen. This was great, because as a plus-size mama and tall and lanky daddy pair, we needed a carrier that would work for both of us. So, I bought the wrap, washed it, and started to wear it that night. I hadn’t felt closer to E than when I was pregnant! It was love at first wear. My husband was a bit unsure of it at first, but after he realized all I could do while wearing the baby, he wanted to join in, too. We were both hooked. So when the opportunity was presented to join Mrs. ‘Ski at a Baby Wearing Class, I was all about it. It took a few days, but Greg was interested too. Off to Robinson’s Happy Baby Company for a free class presented by Pittsburgh Babywearers. Let me warn you, the store is adorable, especially if you are into cloth diapers, I already have a wish list. But, my Navigation (on my phone) did NOT take us far enough down the road and we got lost. Thankfully, the class waited on us, and we hung out for over 2 hours learning about the right carriers for us and what we could move into. It was nice to have our choice of the Moby Wrap affirmed because unlike other similar carriers, it keeps baby from sagging (until they get too heavy) and their chin off their chest. Evan is extremely comfortable in the wrap, which helps a lot. You really have to find what is right for you; however, the wraps or carriers that require sizing are not necessarily the best. We also have a lot to look forward to–other ways to wrap the Moby Wrap, carriers like the Beco and Ring Slings (that if we really wanted, we could carry Ari in. There is also a lending library from Pittsburgh Babywearers and meetings you can attend to learn more about baby wearing. Exciting! Spring is coming, and you are guaranteed to see us rocking our lil man wrapped while we are out and about! (Greg even whipped out the Moby later in the afternoon at a cousin’s birthday party.) Thank you, Pittsburgh Babywearers & Happy Baby Company, for helping us with our journey as Baby Wearers! This entry was posted in About Us, Pittsburgh Fun, Weekends and tagged baby wearing. Bookmark the permalink. Hi! I’m Becky, the mom behind ‘lil Burghers. We love sharing things to do in Pittsburgh with kids as well as toy and book reviews. Read more about us! Love my social icons? Check out igottacreate!